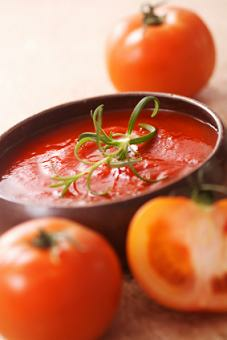 This creamy tomato soup or tomato bisque soup recipe is an easy tomato soup recipe which needs only 15 min preparation and 12 min to cook. 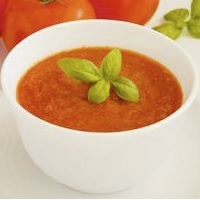 This cream of tomato soup recipe contains only 157 kcal per portion and NO cream! Recipe Nutrition Profile: Healthy Weight, Heart Healthy, High Potassium, Low Calorie, Low Cholesterol, Low Saturated Fat, High Fiber, Gluten Free, Dairy Free. Good Source of: Vitamin A, Vitamin B-6, Vitamin C, Folate. 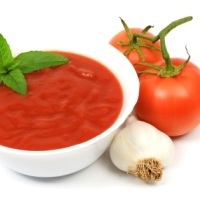 Put the rosemary into a food processor or blender, add the pepper, sugar, half the tomato juice and the plum tomatoes and whiz together until slightly chunky. 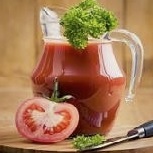 Sieve the mixture into a saucepan and stir in the stock, orange juice and remaining tomato juice. Bring to the boil and simmer gently for about 10 min. Season with ground pepper to serve. 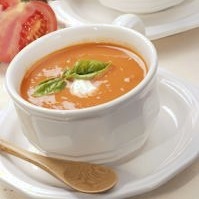 Replace the rosemary with coriander or add a dash of Tabasco sauce if you like it spicy.